Maiyola, a community deep inside Kajuru local government area of Kaduna State is possibly representing several others where there is no trace of presence of government especially when people of such communities are technically disenfranchised in elections. It is about 100 kilometers away from Kaduna, the State capital. Maiyola 1, 2 and 3 is a stationed Fulani normads community with about 5,000 dwellers who are mainly herders and farmers, producing virtually all they need for daily sustenance including herbs for their medical needs which according to them, has led to several avoidable deaths involving more of pregnant women and infants. Accessing the community itself is an herculean task. The moment you descend from single lane Kaduna-Kafanchan expressway at a place called Railway Crossing, then you must look for a place to pull up and then call on a nearby commercial motorcycle operator who will charge about N2,000 for 1hour 10 minutes journey into the deep forest where nature is best appreciated. Now, once you agreed with a commercial motorcyclist on his term of service, the journey into unknown world began earnestly while you stick to your religious fate for safe return from your up and down in ‘Irunmole’ forest bothering Kajuru and Kachia local government areas of the state. And of course, all senses must be put to work in order to have the full grasp of side attractions like different shapes of thatched houses, breed of cattle, sheep and fowls; rivers, small stream and rivulets. Whether you are trendy or not, one thing you cannot avoid as you ride through the rough rocky path that links Maiyola to the rest of the state is to unconsciously dance to the tune the nature will present to you. As an adventurer, one enjoys every bit of the journey except the pathetic, sorrowful and heart rendering tale of the people of Maiyola that requires urgent interventions. The residents told their stories. As it were, where two or three agreed to cohabit, there must be a leader. In Fulani setting, the community is championed by a traditional leader called Aldo Fulani. At Maiyola, aged Alhaji Abu Maiyola is the one saddled with that responsibility. During this visit, he spoke through Safiyanu Umaru, a respected elder in the community. “There has never been a time government officials visited us. We hope your visit will bring development to this community as it has done in other areas. “On the issue of health or pregnant women, honestly our women do suffer a lot since conception. In fact, anytime our women get pregnant, we keep watch until they deliver safely. “You have seen that for yourself. There is no clinic and other social amenities here in Maiyola and this village has been in existence for over 40 years. We are only living here on the mercy of God”, Aldo Fulani said. Another resident of Maiyola, Mohammed Adamu, shared his bitter experience as regard issue of maternal mortality, “I remember the day I took my wife to hospital during childbirth but before reaching a nearby clinic for help, she developed complications and lost her life in the process. “These are some of the problems our women go through. She really suffered on that day before she and the baby died. So we are very happy to see you in this community because we have never seen journalists face to face but here you are in our community. “We also need primary School here in Maiyola so that our children can be educated. They don’t go to school which is far from the community due to insecurity. We hope all these can be address if the government really wants to assist us. 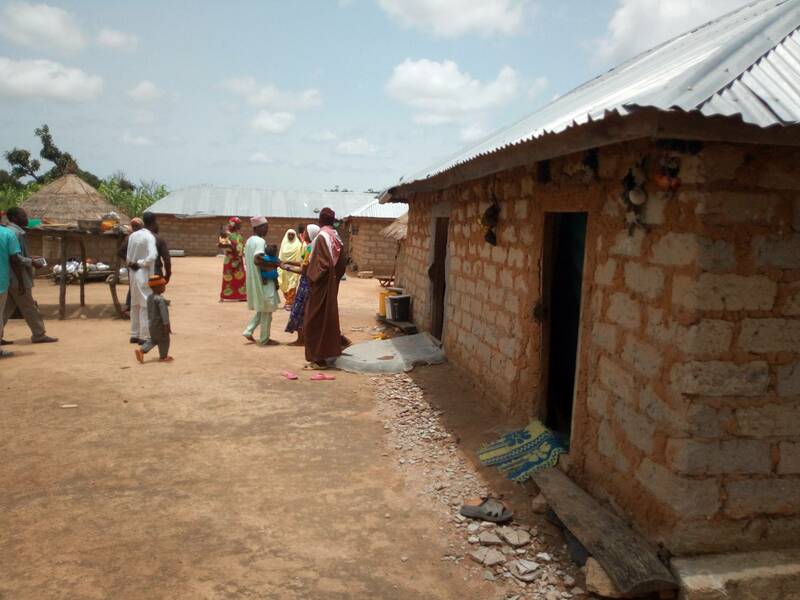 Another elder in the village, Muhammad Haruna, lamented that, the community has never benefited from any government project since its existence, “we always heard on radio people talking about dividends of democracy for us it remains a mirage. This is because we are yet to witness any dividend of democracy. No road and people are suffering from all type of ailments. “We have a very large population here in Maiyola, we made complain to our local government officials but our efforts have not yielded any positive response. We equally have children of school age that are out of school because if distance and security risks. Aliyu Adamu, also a resident spoke on the issue of maternal death which he said has been a big challenge to the locals in the village. “Our women are really suffering during childbirth and our community school is without teachers. The teachers are not ready to come even when they are posted because they are afraid. We also need health facility in the village no matter how small to make it easier for us to visit with our spouses. “We also need secondary school because the one we have is too far from our village making it difficult for our children that completed their primary school to further their education. We need help. “This is why we said our problems are numerous. We are about, 3000 people here at Maiyola 2 and we used to wonder how we are copping without social amenities that others enjoyed in other communities of the state. “We actually in dare need of Primary Healthcare Centre (PHC) closed to us because I almost lost my wife during childbirth sometimes last year. So, we are very worried about this issue of maternal mortality. “Another big problem to us is our inability to participate in the election of our leaders during election. We have a large population but without a voting center. At least let them know people are here and we are interested in participating in governance. Like other citizens, we want to offer our contributions towards electing our leaders but we’re disfranchised due to lack of voting center in Maiyola. “Lack of water is another big challenge in Maiyola because our women and children do trek several kilometers on a daily basis to fetch water. We also drink water from same stream with our animals. Here, Good water is luxury”, he added. However, 60-year-old Salamatu Haruna, who gave birth to 13 children at home boasted that, she never went to hospital during delivery all her life saying in those days, women don’t face much difficulties during childbirth as it is the case with new generation. Even though am not of child bearing age again, but I’m aware women suffer a lot during childbirth in the community. This grandma said, “we used herbs in those days and it really works for us. But this young women now always suffer during labour which I don’t know why. They are being treated like agric fowls. I never attend antenatal care because of the distance and bad road between the village and Kachia or idon to access healthcare service. I may go once during pregnancy and deliver at home because we have traditional birth attendants to assist us. “We do not have good road here that one can easily get vehicle or motorcycle but we have to trek miles except if one is lucky to have a relative with motorcycle who can can offer to help. “We record death of women here because of the bad road. For instance, when a woman is in labour in the midnight no car to take her to the hospital in good time. So she end up developing serious complications that sometimes lead to death because no nearby hospital or health center or even trained health workers around. Another reproductive age woman, Hafsat Abubakar said, she does not go to hospital for antenatal because she cannot trek long distance. “Any time I am pregnant, I don’t go to hospital because the pregnancy comes with fever and since there is no hospital close by, I prefer to stay at home and take local herbs as it is our culture. “I know of four women close to me that loss their lives in the process of child birth here in the village. We prefer patronizing traditional birth attendants because that’s the only option we have here in Miayola. The story of Zainab Abubakar was not that different from earlier speakers except that, she do go for antenatal but not frequent because of the distance and lack of motorcycle that will take her to the hospital. I prefer to go to patent medicine store or idon general hospital. I have the opportunity because I live close to the road. “I know of five pregnant women that died in the community during delivery and that is not good. How can a woman die when she can live. I do give birth at home because my mother is a traditional birth attendant and the culture here is when it is time for you to give birth, you go to your parents house and not your husband house. “I attended antenatal services once because I was asked to go for scanning in Kaduna city and I spent a lot before going for the scanning. “Accessing healthcare services here is very difficult because some of us also feel lazy when you think of how to trek to Crossing before going to Kachia or idon before you get hospital”, she said. Until the people in this community and others in their shoe sigh a sign of relief when their cry reaches listening and compassionate ears, it may take long before they can come out of euphoria of maternal and infants mortality when it is actually avoidable. A stich in time, saves millions.